I had no idea what to expect when I started this book, it is a complex book but the message is clear - we unconsciously apply filters to situations, people etc so much so that is instinct for us ans we don't even know we are actually doing it. 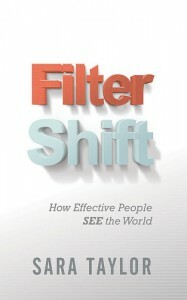 What this book does is, it sets out to help us shift our filters - "filter shifting is our ability to SEE self, SEE others and SEE effective approach" SEE being our levels of observation See Explain & Evaluate. I'm not going to lie this was one of those books that you really need to sit down, think and understand, and when I first picked it up I did skim through it and pick out the main points but then I sat down and really read it and it really opened my eyes up the fact that I am guilty of filter shifting, and after reading I know that it is not going to be an overnight change but a gradual process to filter shift and rewire my brain. I know I judge and have made comments like those mentioned in the book without really thinking it through, so it has given me an understanding as to why our brains are wired this way in order to help change the way I think and see the world.